Best BIG breakfast for you! When life gives you lemons, make the lemonade. When the fridge gives you eggs, find the sausages, fry the bacon, butter that bread and HAVE THE BEST BIG BREAKFAST you’ve been always drooling about and frankly if I had a choice between dinner and lunch together or just Big Breakfast all day, you probably know what the answer already based on the topic I’m salivating upon. Just in case someone forgot how irresistible an image of a BIG BREAKFAST can afford to look like ? For the snoozers scrambling out for a treat, ding ding! 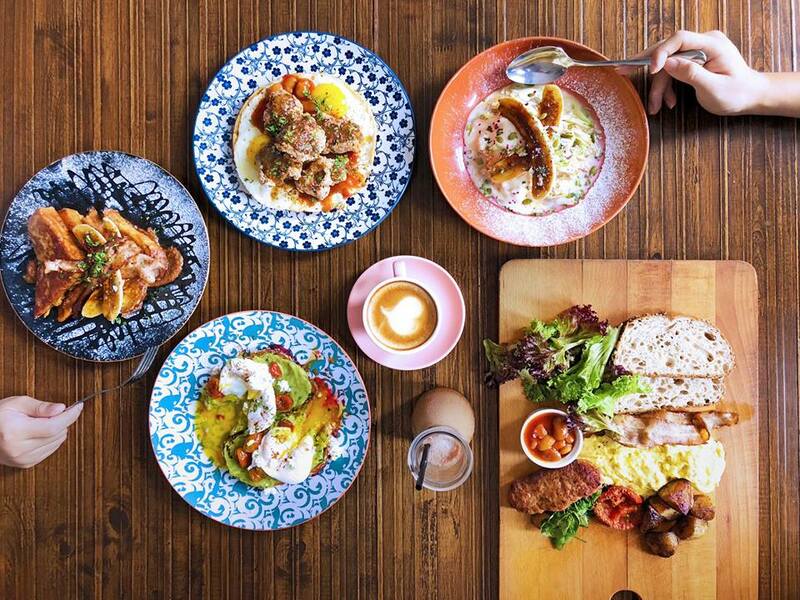 Located at Beach street, Urban Daybreak has mastered their Aussie style of a cooking, presenting breakfasts that will make you turn your head twice. Understanding the concept of savory with sweetness, their fried chicken on a waffle accompanied by sunny side up eggs, baked beans and special basil sauce is a taste bud pleaser. But we here for the big breakfast and they BIG. Worth a visit with some hungry bellies! Half a third of Instagram shots tagging Wheeler Coffee consist of Big Breakfast more than Cofee or Wheels, ironically! Nestled among cafes in Love Lane, Wheeler’s coffee is that one cafe to stop by if you’re unfamiliar with the environment and doubting the quality of food. Though I personally haven’t tried the Big Breakfast (Go try!! Worth every penny,.Less than 25 bucks), their Matcha Lava Cake is the next best thing in the world. No kidding! Hours: 9 AM to 12 AM. Opens daily. Tasty Toasty provides Big Breakfast that would go well with a cup of coffee. And they don’t stop there! Long before the rise of artisan European bread, local Toasts were staples for any working class in Penang; the locals’ favorite way of enjoying a crisp-fluffy toast would be none other than Kaya Butter Toast with soft-boiled Eggs. Basically your local Kopitiam with an edge. They’ve got Scallop with Ebiko Mayo Sandwich, the delicious combination will definitely make you crave for it every day of the week! Google ‘Big Breakfast in Penang’ and this would be the first option shown. Located at the Steward Lane on a morning as tourists head out as early as a bird to explore and locals tucked in their sleep on Sundays, you’d be lucky to find an empty table at 9 am here. Aside from serving the Big Breakfast, which one shall expect nothing but the best with a bit twist to it (chickpeas), the cafe offers a twist of taste to cafe hoppers by featuring Sarawak Kolo Mee. Unconventional is good. Note: It’s always chock full of people, so do avoid peak hours and don’t come expecting a nice quiet ambiance. Coming from a kitchen managed a Mum, Lyna Morgan the owner of Indochine Cafe seeks to facilitate the needs of patrons be it single, heading in with the family or up for an adventure at the beginning of the day. Serving dishes heavily inspired by the Lands of Southeast Asia such as Vietnam, Cambodia and such, start your morning with a comforting bowl of Pho or simply order that Big Breakfast we were talking about and not be disappointed! Recently launching the breakfast menu, Indochine Cafe is offering a 30% off the bill from the 21st of July till the end of July 2018 between 8.30am to 11.30am! 30% is a lot hence, CHOP CHOP! They say “too much of a good thing is a bad thing”, hence featuring this cafe that serves freshly baked croissant with scrambled eggs buttered to perfection alongside English sausage, good to go with a cup of coffee that has been brewed to amaze. Many coffee enthusiasts consider micro-roasted coffee to be the best-tasting coffee in the world, so ya know you’re in good hands at SiTigun. A perfect English Breakfast that isn’t necessarily big yet as satisfying or maybe more. Plus they’ve got National Geography magazine as a side dish of knowledge. Dig in! Comfort food is their forte. A neighborhood joint through and through, this quaint cafe exudes friendliness and most of them living in the Hillside area of Tanjung Bungah will congregate there for their daily dose of brewed coffee, a meal, and a chat. Gusto Cafe is your neighborhood cafe to indulge in revitalising breakfasts and yummy lunches, as well as a variety of coffee and drinks including their unique smoothies. Though lacking in contemporary as other restaurants style of breakfast, it’s nothing short of as their aim is to make you feel at home with a traditional big breakfast and meals! Living Room of Macalister Mansion is for da early birds’ scrumptious Breakfast at Penang. It’s located at Jalan Macalister road. If you know where ‘new’ Loh Guan Lai is, you’ll find it. One can feast on your choice of eggs, several options for toasts, sausages, sautéed mushroom and tomatoes and homemade baked beans that is perfect for the tourists and one heading town on an early adventure! A hidden Penang Love Lane cafe that you might not know! The Behind 50, a restaurant that located beside Love Lane, at Muntri Street Penang, right before the Daily Dose is a humble hippy place to stumble upon, enjoy the comfort of a tight space surrounded by antiques and decoration to keep one’s eyes occupied till the meals hit the table. They’ve got a decent English breakfast, oatmeals, and soups WITH A 20% discount if the order is made on the ‘Oredy’ app. It’s the month of Discount people! Get going. Have you ever tried the McMuffin from McDonalds and wanted more of it? 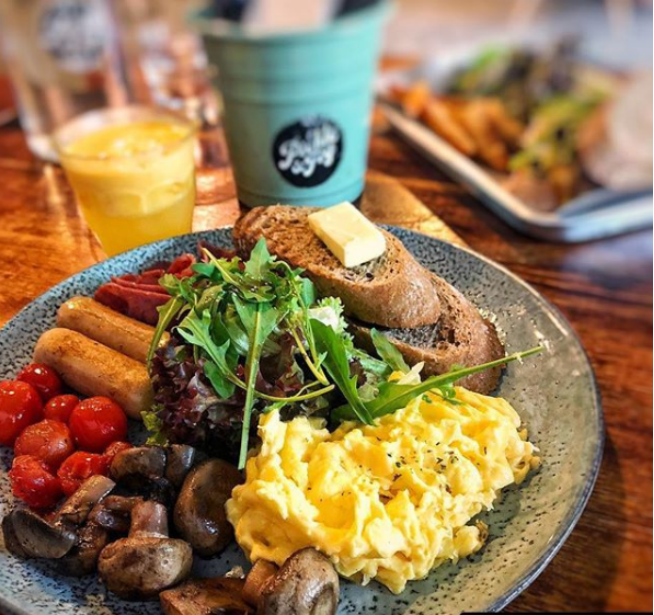 Head to Let’s Meat, a breakfast joint in the residential area of Lembah Permai and be prepared with a big appetite.Let’s Meat boasts over a range of daily specials that one can’t get anywhere else- Biscuits and Gravy, Buttermilk Pancakes just to name a few. That’s “The Hungry Man’s Platter” (Rm 28.90 nett).